It Cools ... It Dries ...The Super� Cool 'N Dry�! 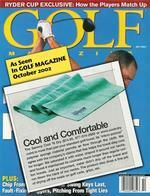 The Super� Cool 'N Dry� Sport Towel - Special Colors and a Special Price! When You're Hot ... It Cools! When You're Wet ... It Dries! 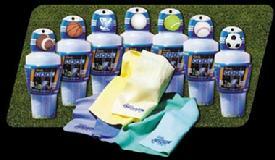 The Super Cool 'N Dry sport towel is the big brother of The Sammy� swimming and diving shammy. Its large size of 17 x 27" is designed to wear around your neck. Made of a high tech PVA polymer material which is highly absorbent, The Super Cool 'N Dry is great for staying cool during hot weather or drying off after a quick shower. Unlike other PVA chamois products, one side is waffle textured for fast cooling. The opposite side is smooth, great for drying off. So, how does it work? The Super Cool 'N Dry is used wet. Simply wet with water, ring out, and the capillary action of the micropores allows the towel to become about 20 degrees cooler than the existing air temperature. Although the product is used wet, it doesn't drip and feels cool to the touch. If the product starts to dry out after the 7th or 8th hole of golf, re-wet with water from its unique container. Wring out, and it's ready for another round. The Super Cool 'N Dry is your "personal air conditioner." The Super Cool 'N Dry comes in its own unique "cup" container that fits a golf cart or stadium cup holder. Fill it with ice water to further enhance the cooling effect of your Super Cool 'N Dry. Each container has its own unique cap: golf, tennis, soccer, football, basketball, baseball, multi-sport, race tire, or marine helm. It is machine washable and lasts for years. FIFTEEN COOL COLORS: Sky Blue, Aqua Green, Turquoise, Chocolate (dark brown), Fuchsia (dark pink), Orange, Light Yellow, Sunflower Yellow, Purple (grape), Royal Blue, Coal Black, Magenta, Desert Tan (tan/gold), Cardinal Red, and Pure White - great for tie dying. Large PVA Shammy Towel - 17" x 27" in Sport Cup container. Suggested retail price: $19.95 each. - Now Just $14.95 each - a $5.00 Savings!